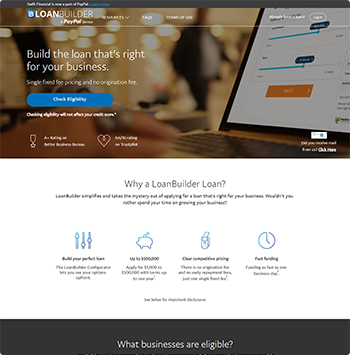 LoanBuilder is a PayPal service that provides short-term loans for businesses and allows potential borrowers to tweak the numbers on their loan settings and customize their loans before being approved. LoanBuilder, which was previously funded by Swift Capital in 2008 and was acquired by PayPal in 2017, is a lender that provides business loans based on your credit history, revenue, and business history. One of LoanBuilder’s perks is that you can propose a loan risk-free and play around with the loan term numbers before submitting any of your personal information and undergoing a credit check. The website and app allow you to change your loan terms and see how it affects your final decision. LoanBuilder assess your Business Credit Health by asking you questions regarding your business and personal credit history, which does not impact your own financial credit. Smaller loans can be processed on the same day if they are received before 3:30 PM EST, while loans over $75,000 take an extra day. Your loan is paid through weekly ACH (automated clearing house) payments from your business checking account. LoanBuilder also allows the option of daily payments, which makes it possible to pay off your loan earlier. Technical support and customer service is available by email anytime or by phone from Monday through Friday from 8 am to 8 pm ET. Nationwide Service: LoanBuilder offers services in all 50 states. Accredited Service: They have an A+ from the BBB (Better Business Bureau) and have a 9.4/10 on Trustpilot. Transparency: Their website provides transparency in regards to their loan terms and fees. Great Customer Service: Most customers reported good customer service, including timely communication and status updates with LoanBuilder. Apps To Keep You Updated: LoanBuilder has a mobile app for Android and iOS that keeps you updated on your loans, interest rates, payment amounts. Fast Cash: LoanBuilder funds loans fairly quickly, sometimes in as little as one business day. No Extra Fees: There are no origination fees, stacking fees, or hidden fees. Weekly Repayment: LoanBuilder provides weekly fixed-rate repayment terms, although you do have the option of daily payments. Customers reported inconsistent customer support and stated that they had trouble with timely communication. Customers can only contact LoanBuilder by phone or email. LoanBuilder’s repayment terms are short and loans must be paid back in 12 months. Weekly repayment rates are much higher for LoanBuilder’s short-term loans. Borrowers must have several qualifications to receive a loan: 1) Be in business for a minimum of 12 months without any active bankruptcies 2) A credit score of 600 3) Make at least $100,000/year from business revenue 4) The business can’t be in a list of prohibited businesses and should also have an active record with the Secretary of State. LoanBuilder uses a formula called the Business Health Credit Score, which takes your credit score, credit activity, revenue, number of employees, and previous LoanBuilder or Swift experience into account. While a score of 100 is considered excellent, you need at least a 55 to qualify. LoanBuilder's loan amounts range from $5,000 - $500,000. Their term length is 13 - 52 weeks. They have a flat fee that ranges from 2.9% - 18.72%. There are no origination fees, stacking fees, or hidden fees. They may require a UCC-1 blanket lien. You are able to view your potential loan terms by answering six questions regarding your business’s credit and income, which allows you to prequalify and does not result in a credit check. These questions are 1) What is your estimated annual business revenue? 2) How long ago did you first establish business credit? 3) How long ago did you first establish personal credit? 4) How many times have you applied for personal credit in the last 6 months? 5) How much available credit do you have on your personal credit cards? 6) What is your estimated personal FICO score? The LoanBuilder Configurator allows you to test different loan amount and terms and see your weekly payment, total repayment, and interest rate. Once you are preapproved, you must provide documentation to receive the loan. If your contract is signed before 3:30 EST, you can receive your funds as soon as the next business day. LoanBuilder allows you to tweak your loan settings to see your potential interest rates, total repayment terms, and weekly repayment terms to find the best loan before you commit to a loan. How do I know if I qualify for LoanBuilder? What is your estimated annual business revenue? How long ago did you first establish business credit? How long ago did you first establish personal credit? How many times have you applied for personal credit in the last 6 months? How much available credit do you have on your personal credit cards? What is your estimated personal FICO score? If you prequalify, you can submit a loan and receive the funds as soon as the next business day.